I just picked this up at a garage sale today and it rocks very well. The control knobs are very smooth, the speaker connections are good It has excellent power for my basement workshop and it blows away my old Kenwood that now gets bumped to the outhouse. I have a big old house, so I try to have a stereo in every room that I spend much time in. I don't watch much TV, so I appreciate good sound, even though I am not an audiophile with big budget speakers. But it rocked my Bose speakers and sounded even better with my newer Kenwood speakers. I think it will be too loud for my backyard rock speakers or my outdoor Tiki Bar at the lake. Whistles and Bells! Smooth Natural Sound! DSP modes. Low price. Hi performance. Very reliable. Have never had any problems with it. Very high quality receiver with a great sound. Low power to rear and center channels. I have owned this receiver for over 5 years now. It has been very reliable and produces very good quality sound. This unit gives a very nice, almost natural sound. No audible distortion at normal to high levels. Lack of 5.1. Also, the center and rear speaker levels don't get quite "loud" enough to keep up with the front speakers. Or, I should say that they keep up, but I cannot make them any louder than the front speakers, which would have been nice with a few of the poorly taped movies I have watched. This is a very nice unit, great for small to moderate rooms. I've had it for three years, and have never had a problem. Much like my five-disc Yamaha CD-Changer, this unit has been 100% reliable. I have not experienced any of the problems other users below had. I would buy another Yamaha. High end sound quality / Low end price. Close to NO sound from rears and center... No sub. output. I do like the sound quality the thing emits... although it can be a little fuzzy at times. The outputs are of few but I am using a pair of Bose® 201 series IVs as mains, a pair of Boston Acoustics HD-5s as rears and a Cerwin-Vega! 12" Sub. (Hooked up to the 'B' speaker output due to the lack of a Sub. output.) 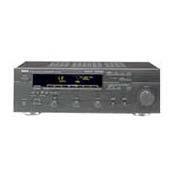 This receiver is great for a small room or even maybe an apartment. But I wouldnt suggest it for a larger room. Great sound, easy controls. True to the Yamaha quality. Good sound quality at all levels of volume. Home theater special effects are wonderful. A very enjoyable system. Great features that all perform up to Yamaha top of the line expectations. The Yamaha sounds great for low end receiver. I have a problem with the sound decreasing after listening to it with the level turned up (past 3). The shop say's there is nothing wrong with it however??? with my Marantz CD player and Warfedale diamond 7.2 speaker. For the sound quality, I give it 4 star.